Abstract Submission hits a new high | Plan your Journey to Berlin! Read this e-mail in your browser. 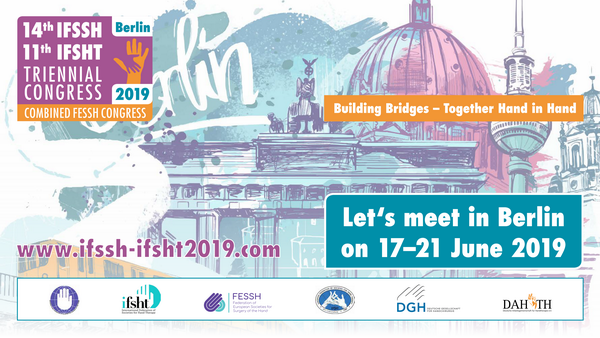 Abstract submission for the forthcoming IFSSH & IFSHT Congress closed on 15 October 2018, with roughly 1,800 abstracts submitted, nearly tripling the previous congress’s figure and a fantastic new record for the world's largest meeting on hand surgery and hand therapy. Although the scientific chairs make good time with the reviewing and session planning, the whole process will take a little while longer then originally estimated. Information on acceptance or refusal of submitted abstracts will be sent out by mid-January 2019. Plan your journey to Berlin with our special offers for congress delegates. For the time before and after the Congress, explore our travel suggestions in Germany and Europe. Please refer to the practical information on topics such as electricity/voltage, vaccinations or visas. For your stay in the German capital we recommend the official congress hotel The Ritz Carlton Berlin. The Ritz Carton is also the venue of the Congress Dinner & Party on 20 June 2019. This e-mail was sent to unknown@noemail.com. Click here to unsubscribe.